Summer can be busy and that may be the reason I forgot to post this final image of Mozart’s Serenade. Besides not posting this image earlier I also forgot to create a video demonstrating the music that is part of this artwork. That happened because I wanted to add this artwork to a show of my recent works at our local gallery, Artisan Forge. This is the second of my works, Rondo Alla Turca was the first, to have the music built into the artwork. If you look at the lower left of the above final image there is a red button to play the music that represents this artwork. Top to bottom on this forward panel on display through this month of August, are the artworks, Runnin’ Down a Dream, The Mozart Serenade, In The Mood and my favorite polka, Polka, POLKA! artwork. In the back display, the long green and tan artwork on display for the first time, Mr Brightside, I painted in 2016. I have mentioned that the use of a lot of solid bright colors on this work and the earlier Rondo Alla Turca are very similar. I hope to change that trend starting with my current project Rhapsody in Blue. I plan on pulling back on the miscellaneous, splish, splash, use of solid colors. One reason for making this change, is that too many solid colors placed randomly on an artwork, lessens the value, and impact, of the adjacent colors. I will explain my decision to change direction, and why so quickly, in my next blog entry. 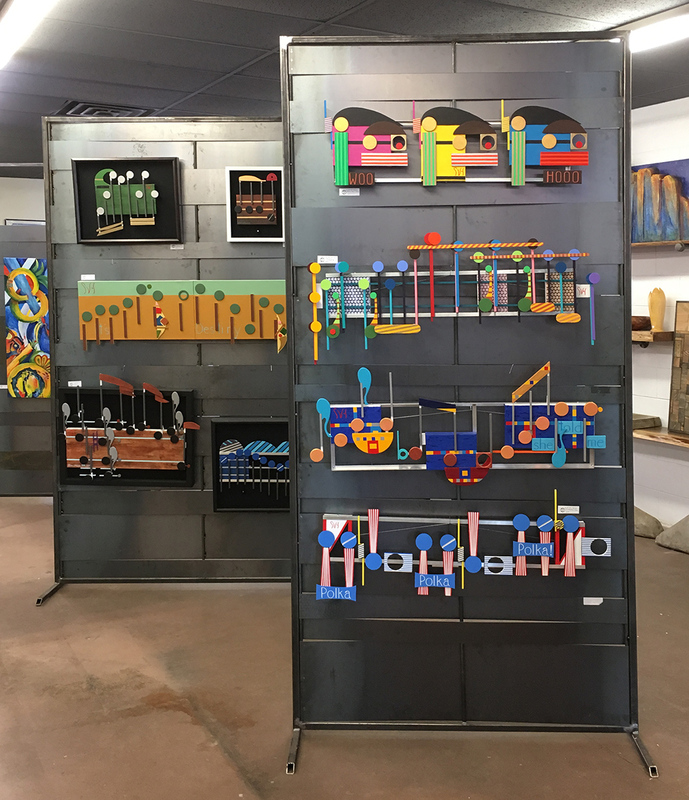 For now, if you wish to buy this amazing bright-colored Mozart artwork the price is a reasonable $800.00 at the local Artisan Forge gallery. ~ by Scott Von Holzen on 08/06/2018.